And greetings friends! This is Herbert W. Armstrong with the Good News of the World Tomorrow! Did you know that what has been recognized as the greatest sermon ever preached was actually not a sermon at all but merely a matter of Jesus Christ talking to His disciples? And what He told them in that so called Sermon on the Mount, the greatest sermon ever preached, had to do with world conditions and with the world tomorrow. Let's look at it. Let's get this in its perspective. Why is it we have not heard the true Gospel of Jesus Christ? Why is it that we have a heard a different, another gospel and that we have not heard too much about the real Jesus as He is pictured in the Bible, but another Jesus, at least a Jesus of somewhat different character altogether. Let's get it straight. It's about time, don't you think, that we blew the dust off our Bibles to see what the Bible does say. Because most of us, my friends, have been believing exactly the opposite of what it says. Most of us have thought the Bible says the opposite of what it does say. Now, in the story-flow of the four Gospels — Matthew, Mark, Luke and John — telling of the events in the life of Jesus, of what He preached, of what He taught and of the example that He set for us, the things that He did, we came in the last broadcast in this series in the 6th chapter of Luke where ". . . in those days, Jesus went out into a mountain to pray; and he continued all night in prayer to God." There was a reason for that. "And when it was day, he called his disciples. . .", of whom there by that time a good number. ". . . and he chose from them, twelve. . ." He selected twelve and chose twelve out of them, ". . . whom also he named apostles. . ."
Now, we've seen in the past programs in this series of where Jesus was walking along and He saw a certain man and He called that man to follow Him and to become His disciple. He found Peter and his brother fishing as fishermen. He said, "Come and follow me." They didn't come to Jesus and say, "Can we follow you? Well, we would like to follow you. We have decided we'd rather be preachers than anything else. We believe that's the easiest way to earn a living and we would like to choose that as our profession. Will you let us become your minister? May we follow you?" They didn't say that. Instead, they thought they wanted to be fishermen, Matthew thought he wanted to be a tax collector, but Jesus said, "You follow me." He chose them! They did not choose Him. So, He had prayed all night. And after prayer ALL night long, Jesus had wisdom and knowledge. He had been so close to His Father, that He could act with unerring judgment and have the wisdom to know just whom He should select from among the disciples and which should be the twelve that later were to become His Apostles. The Apostles carrying the authority of the Kingdom of God and going out as Christ's own ambassadors representing Him and His Government, because it is a matter of Government. Now let's look into and see. These were later apostles. There was Simon, who also was named Peter, and Andrew, his brother, and James and John, Philip and Bartholomew; they're all named here. And then, we return back to the 5th chapter of Matthew which is the very next event in the actual story-flow if we put all of these gospels together. "And seeing the multitudes, Jesus went up into the mountain: and when he had sat down, his disciples came unto him . . ." He went away from the multitudes. 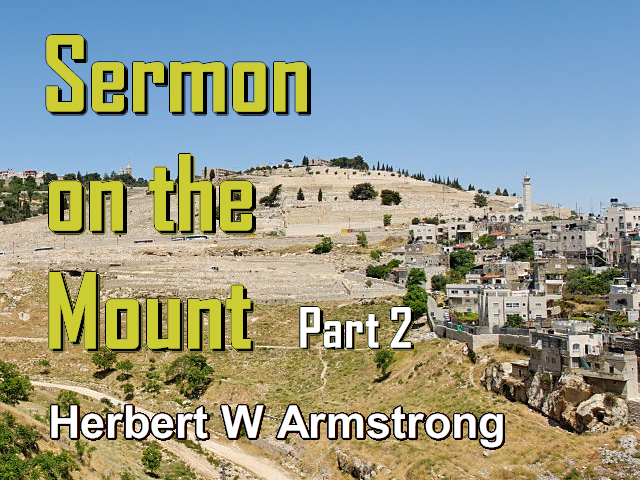 He went up into a mountain and sat down to get away from the crowds as we have been seeing as we've gone through up to this point in the New Testament that He so often did. ". . . and when he had sat down, his disciples came unto him: and he opened his mouth and taught them, saying. . ." I want you to notice, He had gone up into the mountain away from the crowd. His disciples followed after Him and arrived there shortly after He did, apparently. ". . . and he opened his mouth and taught them. . ." Who is the them? The them refers to His disciples, the twelve that He had chosen and not to the crowd. ". . . and he taught them, his disciples saying: Blessed are the poor in spirit. . ." Now, wait a minute. I wanted to check that with the King James because I'm reading that in the Revised Version. Oh yes, I know what it is. It is in Luke's account. Matthew records it, "Blessed are the poor in spirit, for theirs is the kingdom of heaven." But Luke records it in the 6th chapter of Luke and verse 20, ". . . he lifted up his eyes on his disciples. . ." Notice, "on His disciples", not on any great crowd or multitude. This was not a sermon started out to a great multitude of people. But ". . . he lifted up his eyes on his disciples, and said, Blessed are ye poor. . ." Ye poor, He was speaking specifically to them. ". . . for yours is the kingdom of God." Now Matthew said kingdom of Heaven and Luke says kingdom of God. They're both reporting the same identical words of the same identical man at the same identical time. And Matthew recorded it as the kingdom of Heaven and Luke recorded it as the kingdom of God. I received a letter from a schoolteacher up in Oregon. That is a former schoolteacher, I am not sure she still is a schoolteacher She wanted to know if I remembered some years ago when I was holding a campaign, an evangelistic campaign, up in Oregon, north of Salem in Oregon, and how I had offered five dollars to anybody that could show me any promise that anyone now living can ever go to Heaven under any conditions whatsoever. She came to me at the close of the service and she said, "Mr. Armstrong, I'm just mercenary enough to demand that five dollars." "Well," I said, "You produce the promise in the scripture and I'll give you the five dollars." Well, she turned, she said, "I want you to notice in Matthew the 5th chapter in the 11th verse and the 12th verse, 'Blessed are ye when men shall reproach you and persecute you and say all manner of evil against you falsely for my sake. Rejoice and be exceeding glad, for great is your reward in heaven. . .'"
Actually, I don't think that is the exact one. I want to comment on that a little later. But that is not the one either that she selected, but this one here I think. It's mentioned twice in this passage here. "Blessed are they that have been persecuted for righteousness' sake:. . ." This is it. ". . . for theirs is the kingdom of heaven." "Now there," she said, ". . . theirs is the kingdom of heaven." She said, "Five dollars please." "Well," I said, "are you a teacher here, one of the teachers in this school?" I said, "Do you feel you're qualified to teach?" "Yes," she said she certainly did! I said, "And you don't know the difference between the word 'of' and the word 'in'?" I said, "Do you know what that word 'of' denotes? In New York City, there is the Bank of Morgan. Is that bank inside of Mr. Morgan? Does the Kingdom of Heaven mean Kingdom in Heaven? Does that mean go into Heaven?" She looked a little peculiar. I said, "Did you know that in Luke's account, he calls it the Kingdom of God everywhere and reports the same words that Jesus said." Now, the Kingdom of God is not a kingdom that's inside of God. It is a kingdom that God rules and governs. In other words, the Kingdom that belongs to God. The word "of" denotes ownership. You can have the house of Morgan or Morgan's house. You can have a house of John that belongs to John or it can be called John's house. It's all the same thing. The word "of" denotes ownership. Now, there is no place in the New Testament where you find the expression "kingdom of heaven" except in the writings of Matthew. And in most of these cases, Mark or Luke or John will record the same words and always they record it that Jesus said "kingdom of God". Actually, I think Jesus perhaps said either both or the both have the same meaning. For the simple reason it means that since God is in Heaven and Heaven is God's throne that the of denoting ownership it is the Kingdom that is owned in Heaven or by Heaven. It belongs to Heaven which is the throne of God and it belongs to God. It's the Kingdom of God. But no place does it speak about our going up into Heaven into that Kingdom. The nearest that we could possibly get would be a few of the places in the Book of Revelation where it is speaking in parables and a vision which John saw. And apparently he was taken to Heaven where he saw things but what he saw in the vision that was only a vision and what he saw there was merely something in a vision to represent real events that are to take place on the earth, not in Heaven. He appeared to see the events in Heaven but the events when they take place are to take place on the earth. Now, Jesus had said, "No man has ascended up to heaven but he that came down from heaven even the Son of man." Now, did Jesus tell a lie or had anyone ascended to Heaven. Now, we know that David is going to be in the Kingdom of God. Let me just give you two or three scriptures here very very quickly. We will turn, let me see, to the 37th chapter of Ezekiel, and here we have, let me see, down here in the 24th verse, "David my servant shall be king over them." It's been speaking about the resurrection and Israel and Judah both being gathered together at the time after the Second Coming of Christ and in the Kingdom of God at the time that the Kingdom of God rules the earth at the beginning of the 1,000 year reign with Christ. And it says here in verse 24, "And David my servant shall be king over them. They shall have one shepherd and they shall also walk in my judgments and observe my statutes and do them." Well, then again the next verse, "And my servant David shall be their prince forever." Well, David is dead. And still there is another place, if I can find the exact one in a hurry here that I had in mind. And apparently, I haven't marked it in my Bible and don't remember exactly, but it's the passage, "David whom I will raise up unto them." Showing that David is to be resurrected at that time. And that God will resurrect David out of the tomb or the ground of the earth. Now then, we turn on over here to the Book of Acts and in the very 2nd chapter of Acts the first inspired sermon preached by the Apostle Peter by direct inspiration, the first really inspired sermon preached by any of the Apostles after the ascension of Jesus Christ. And about David he said, "For David speaketh concerning Christ, I foresaw the Lord always before my face. . ." This is verse 25 in the 2nd chapter of Acts. "For he is on my right hand that I should not be moved." Well, let's see, let's drop down a little ways. The 29th verse, "Men and brethren, let me speak freely unto you of the patriarch David, that he is both dead and buried." Now, he didn't say "was" but "is". That "is" was present tense at the time that Peter was speaking. At that time Peter was speaking many centuries after David had died. He said that David is, that is he still is dead and buried. And the man isn't buried until he's covered up. He's in the ground and covered up with dirt — he is buried. ". . . and his sepulcher is with us unto this day." Now, in verse 34, Peter here said under inspiration, "For David is not ascended into the heavens but he saith himself the [Eternal] said unto my Lord, sit thou on my right hand until I make thy foes thy footstool." Now, David was not ascended into the heavens. David is to be in the Kingdom in a resurrection. Where is David going to come from, from up in Heaven at the time of the resurrection? How is he going to get into Palestine to be with Christ there and to rule under Christ? Now, Christ Jesus will come again as the King of kings and Lord of lords ruling over ALL nations. But one of those nations over whom Christ will rule is the Kingdom of Israel. Now, there will be a king over each nation and those kings will be under Christ who is the King over all the kings. Now, who is the one king over the one nation Israel at that time? Why, David is to rule over Israel. It's made very plain in a number of prophecies in the Bible. Now, where is David coming from? If 1900 years ago, which was already then several hundred years after he died, he was dead and buried and was still buried, and David had not ascended into the heavens and if Jesus said at that same time that ". . . no man has ascended up to heaven but that he that came down from heaven, even the Son of man . . .", how is David going to get into the Kingdom, if he's not in Heaven? Where is he going to come from? Well, we turn now to I Thessalonians the 4th chapter. And here Paul is telling them that he would not have the Thessalonians ". . . be ignorant, brethren, concerning them that are asleep. . .", and he meant dead. Of course, I think some people today would rather sneer at Paul and call him a soul-sleeper because he used the word sleep. Well, I'm just reading this out of the Bible. So don't accuse me of being a soul-sleeper, I'm reading this out of the Bible. ". . . them that are asleep. . ." and he meant those that are dead. And David was dead and buried in his sepulcher with them until that very day as Peter had said. And he had not ascended into heaven as Peter also said. And Jesus said, "No man had ascended to heaven." Now, notice. He was one of those that were asleep. ". . . that you sorrow not, even as others that have no hope. For if we believe that Jesus died and rose again. . ." Now, when Jesus died, He went into the ground too just as David did. Let's turn back and read that again as Peter explained it in the 2nd chapter of Acts. Going back, I had read verse 25. Let's come to verse 26, "Therefore did my heart rejoice, and my tongue was glad; and moreover also my flesh. . .", my flesh, David read, ". . . shall rest in hope: Because thou wilt not leave my soul in hell. . .", ". . . will not leave my soul in hell. . ." Now, where was His soul? Where is this hell? Let's let the Bible interpret where this hell is. It comes from the Greek word Hades, which means — a hole in the ground that is covered up — it means a grave. And don't let anyone tell you that it means some mystic place of living souls — that is a comparatively modern definition. In our library in Ambassador College, our Bible and theological library, we have some very ancient books that are four, five hundred years old. And one is a Bible dictionary that goes way back there that explains what soul is and what hell is and some of those things. And I tell, this modern definition of that word sheol in the Hebrew and hades in the Greek meaning a mystic abode of living spirits is a comparatively new and modern idea. It is not a correct translation. At the time the King James Bible was translated back in 1611, and some of these books we have are older than that and were printed before that time, and at that time, the people in England customarily talked about putting their potatoes in hell for the winter. Now, hell was merely a hole that they'd dig in the ground and they'd cover them up and that's a pretty good way to keep potatoes. Well, hell has come to have a new meaning by a lot of people that are trying to believe and to induce others to believe that hell is not what it always did mean and what it means in the Bible but something else. Now, just listen and see how the Bible defines it. David said, that "you will not leave my soul in hell, neither wilt thou suffer thine Holy One . . .", that's Christ, ". . . to see corruption." David knew that 100 years before Christ that Christ the Holy One — the Messiah — would not see corruption. Now, corruption means that when you die — the body rotting and decaying. The body of Jesus never saw corruption — it did not rot or decay. He was resurrected before that decay could set in. And so David knew that. He said that ". . . thou will not let thy Holy One see corruption." He didn't say that his body would not see corruption. But he said, ". . . thou wilt not leave my soul in hell. . .", that is in the grave — in hades. Now, there is another hell fire, let me just say right now. I know we have a lot of new listeners that are going to say, "But didn't Jesus talk about hell fire?" Yes, He did. But where He did, my friends, remember the New Testament was written in the Greek language and not in the English, and where He used the words hell fire He was quoting from another Greek word altogether which is "gehenna" and is not "hades". There are three Greek words that are all translated hell in our American English translations and, most of them anyway, in the King James especially, and each one of those Greek works has a different meaning. Now, "hades" means the grave. That is the word here used. Gehenna was a place of burning, yes, but it was the valley of Hinnom, called Gehenna, at the southern boundary of the city of Jerusalem, where there were fires down below and the garbage and bodies of dead animals and even of criminals were dumped over the ledge to fall down into the fires below where attendants kept them burning all the time. And they burned up and consumed everything that was put in. But you know those bodies when they were thrown down there didn't keep burning and burning and burning forever and they were dead already and not alive and they just burned up. And that was the gehenna that Jesus used to talk about hell fire and it was a place of destruction. It was a place of absolute burning them up until nothing was left but ashes on the ground and the smoke that had gone up and mixed up in the air and had ascended clear up. I wish the smoke here in Los Angeles would go up forever and forever and get clear away from the atmosphere so we wouldn't have this smog. It seems that the mountains around Los Angeles are arranged in such a manner and the air condition is such that the smoke here doesn't rise up and it gets mixed in the air and we're getting a smog condition that those of us in Los Angeles don't like very well and we hope they get the smog condition cleared. But normally smoke just rises up and up and up and it finally is dissolved in the air. Well now, he said here that Jesus, the Holy One, His body or His soul would not see corruption. "Thou hast made known to me the ways of life; thou shalt make me full of joy with thy countenance." Then he said, "Men and brethren, let me freely speak unto you of the patriarch David. . .", this is Peter speaking, ". . . that he is both dead and buried, and his sepulcher is with us unto this day. Therefore being a prophet, and knowing that God had sworn with an oath to him, that of the fruit of his loins, according to the flesh, he would raise up Christ to sit on his throne . . ." that is, to sit on David's throne. I want you to notice, Jesus was to be resurrected to become a king and to sit on the throne and to rule. "He seeing this before. . .", David seeing it before, ". . . spake of the resurrection of Christ, that his soul was not left in hell. . ." Then Jesus soul went to hell. Now, where did Jesus go? When He was dead, Joseph of Arimathaea, that's not the ancient Joseph, but Joseph of Arimathaea, a rich young man, took the body of Jesus and because there was not time until sunset when the Sabbath day the annual high day Sabbath preceding the Passover would come on and it was unlawful to do the work of burying after the Sabbath, Joseph hurried to bury the body of Jesus in his own new tomb hewn in the rock, right in the very heart of the earth, so that He could be buried before sunset. and his tomb happened to be just near by and there wasn't time to go any further. Now, Jesus was actually buried and covered up and there was a great stone rolled up to cover up that tomb. Now David ". . . seeing this before spake of the resurrection of Christ, that his soul was not left in hell . . .", that is hades or the grave,". . . neither his flesh did see corruption. This Jesus hath God raised. . ." And He was raised from that grave. And when Mary Magdalene and the other Mary came to the sepulcher on that Sunday morning, He was not there, He had risen before Sunday morning at sunrise. He didn't rise on Sunday morning either. That's another thing. Why don't you write in for our booklet on the truth about the resurrection — it was not on Sunday. The crucifixion was not on Friday, Good Friday, bad Friday, any other kind of Friday, it was just not on any Friday. Write in for booklet on the resurrection and the mailing address is Herbert W. Armstrong, P.O. Box 111, Pasadena, California. I'll announce that again in about five minutes and so have pen and envelope or paper ready to jot it down. Write in for that booklet on the resurrection. I probably won't think to remind you of it again then, but I'll give the mailing address again and you better write in for that before you forget it. It will certainly open your eyes if you want to know when the resurrection was. Well now, turning back here to I Thessalonians the 4th chapter, "For if we believe that Jesus died and rose again. . ." And Jesus was in hell too wasn't He. But His body was not left in hell and it did not see corruption. He was resurrected after three days and three nights and His body did not see corruption and He died and He rose again. Now, to rise is to go up, not to go down. Descending is coming down and rising is going up and Jesus was on the way up. He came up out of the ground. ". . . Jesus died and rose again, even so . . ." Now, even so means in the same manner by dying and by rising or coming up from the ground. ". . . them also which sleep in Jesus . . ." That is others that are asleep and David was asleep and David was dead and buried and his sepulcher was with them 'til that day. Even them ". . . which sleep in Jesus will God bring with him . . ." How? Even so, by bringing them up out of the ground. It doesn't say He will bring them down from Heaven. Now, let's go a little farther and you'll see exactly how it is. "For this we say unto you by the word of the Lord, that we which are alive and remain unto the coming of the Lord . . ." This is the Second Coming of Christ. This was written after Christ had already been on this earth and had ascended to Heaven and He hasn't come back yet, so He is still to come. ". . . we that are alive and remain unto the coming of the Lord shall not prevent . . .", or rather precede, ". . . them which are asleep. . . .", or rather he meant those that are dead. If you're not a so-called soul sleeper, I just want you to understand those that are dead. "For the Lord himself shall descend . . ." Now, He ascended and went up to Heaven. He had rose up and came up out of the grave. Now, He's going to come down from Heaven. And Jesus said, "If I go, I will come again." He rose up from standing on the Mount Olives and the disciples were there with Him. And He rose clear up into the air, into a cloud which enveloped Him and covered Him and then the cloud started ascending way up into the heavens. And the disciples started just looking up into heaven as they saw the cloud go and angel said, ". . . Ye men of Galilee, why stand ye here gazing up into heaven? this same Jesus, which you have seen taken up into heaven, shall so come in like manner as you have seen him go . . ." Now, going He went up, coming He shall come down but in the same manner just like one of these movies in reverse. He'll come in the clouds and every eye shall see Him and He'll come right down out of the clouds and He will stand on the Mount of Olives that very same day. Let's go on and find that. Now . . .
"For the Lord himself shall descend . . .", that's coming down ". . . from heaven . . .", as He went up, ". . . with a shout of the voice of the archangel, the trump of God . . .", that's how secretly He's coming when nobody is going to hear or see anything about it. It says here He's coming, ". . . with a shout, with the voice of the archangel, with the trump of God: and the dead in Christ shall . . .", WHAT? Not come down from Heaven with Him! They're not in Heaven. No man has ascended up to Heaven! But ". . . the dead in Christ shall rise . . .", they shall rise, ". . . first . . ." Jesus is descending, coming down! The dead are rising, going up. "Then we which are alive and remain shall be caught up . . .", we go up too from the earth, ". . . together with [them] in the clouds to meet the Lord in the air . . ." He's coming and that word meet, the original Greek words, mean meeting someone that is coming and turning around and coming right back down with them! ". . . to meet the Lord in the air: so shall we ever be with the Lord. . . ."
Now, where do we go from there? That doesn't tell us there. It just leaves us right there. But you turn over to the 14th chapter of Zechariah and you read here: "Behold, the day of the LORD cometh, and Jerusalem's spoil be divided in the midst of thee. I'll gather all nations against Jerusalem to battle . . .", and so on. And in verse 4, it says this: ". . . his feet shall stand in that day on the mount of Olives . . .". The same day that He comes, His feet will stand on the Mount of Olives! That's the way He went from the Mount Olives and the dead will rise out of their graves — that's where they are and not up in Heaven! Well, we didn't get far in that so-called Sermon on the Mount or Jesus teaching of His disciples. We'll pick that up again tomorrow. . . . just a few seconds in closing. You'll want to get the United States in Prophecy. Now, tell me first the call letters of the station to which you're listening. There's no charge.